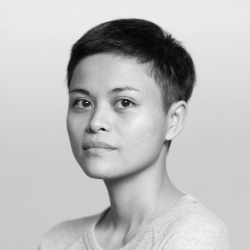 Born and raised in Dumaguete City in the Philippines, Maria Taniguchi received a MFA in Art Practice at Goldsmiths in London in 2009 and a BFA in Sculpture at the University of the Philippines previously. Taniguchi was recently selected for “Art Statements” (2013), a section of solo presentations by emerging artists at Art Basel 44. Other recent projects include “HIWAR: Conversations in Amman” in 2013, a residency and exhibition program curated by Adriano Pedrosa at the Khalid Shoman Foundation in Amman; and “Without a Murmur” in 2012, a group exhibition curated by Joselina Cruz at the Museum of Contemporary Art and Design (MCAD) in Manila; and “The Philippine Contemporary: To Scale the Past and the Possible”, an exhibition curated by Patrick D. Flores at the Metropolitan Museum of Manila. Maria Taniguchui received the Ateneo Art Award for her solo exhibition “Echo Studies” in 2011 at the Jorge Vargas Museum. In 2012, she received the same award for the video Untitled (Celestial Motors) in 2012 shown at Silverlens Manila. Maria Taniguchi concerns herself with art as the materiality itself. Through this she has explored, almost unrestrictedly, various materials and objects through forms as diverse as pottery and video. When it comes to the traditional mediums such as painting on canvas, her continued exploration of the materiality of the subject—its place in time, in history, in our visual compendium—does not cease and often results in massive pieces of entity without a traceable subject matters and is instead embedded with a kind of distributed process which makes it hard to distinguish between painted images or constructed objects.